I warned you a few days ago that I’m a slow learner, and all the troubles I had with my bakery sign didn’t teach me my lesson not to choose elaborate fonts to cut out on vinyl with my Silhouette machine. I truly expected this project to be a failure and probably be a total waste of time, but I felt compelled to try it anyway. Here’s why. I bought an adorable 1895. It is filled with some wonderful illustrations that I’ll be sharing at another time, but this page in particular stole my font-loving heart. I admire the emphasis they put on good penmanship many years ago, and wish it was still considered as important. I knew I wanted to do something with this page. I thought about turning into canvas wall art, so I had a copy made in black and white on blueprint paper at Staples. It’s nice, but since it’s just black and white, it lost some of its aged look in the printing. I may still tackle that project later, but I really wanted to do something with the image NOW. The right side of my brain was winning the battle. I loaded the vinyl in the machine and told it to start cutting. I didn’t stick around to watch the slicing and dicing begin on the vinyl – I headed out to my workshop to find something I could paint the image on. 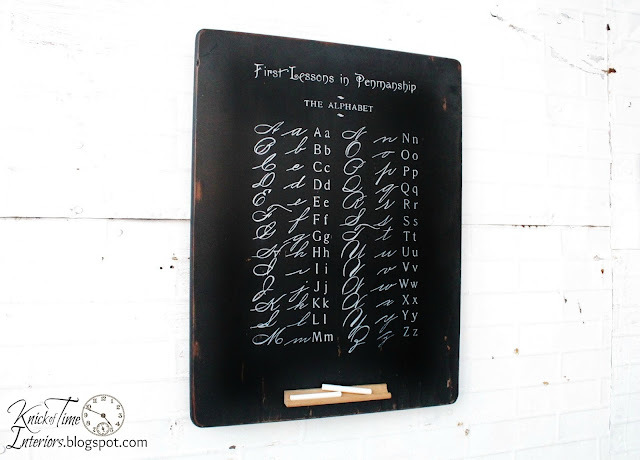 I found the top off of an old school desk and decided to paint it with chalkboard paint, thinking it might look like an old school chalkboard, on the off chance this project worked at all. I sped up the drying with my blow dryer, then retrieved the vinyl. Wow…it doesn’t look too bad. I knew the hard part was coming though…getting it off the backing paper and onto the wood. I called in backup troops to help me separate the vinyl (Contact paper) from the backing paper. I warned my husband that we were probably wasting our time because I didn’t expect this project to work out at all. It took us 30 minutes, working together to get it off the backing paper and onto the wood. I was seriously blown away that we accomplished it. I was starting to feel a glimmer of hope that my vision for that old book page might become a reality. The painting came out about as close to perfect as I could have hoped for in my wildest dream. There was almost NO bleed and the letters had very crisp edges. The vinyl pulled a little of the black paint off the board, but I was okay with that, because I was going to distress it anyway, so it saved me that step! My plan is to start convincing myself that all my projects will be failures and hope they meet with the same success. You might think I’m being melodramatic about the difficult in working with fancy lettering – that’s what I’d think anyway, but here’s a little visual to help you understand part of what makes them tricky. 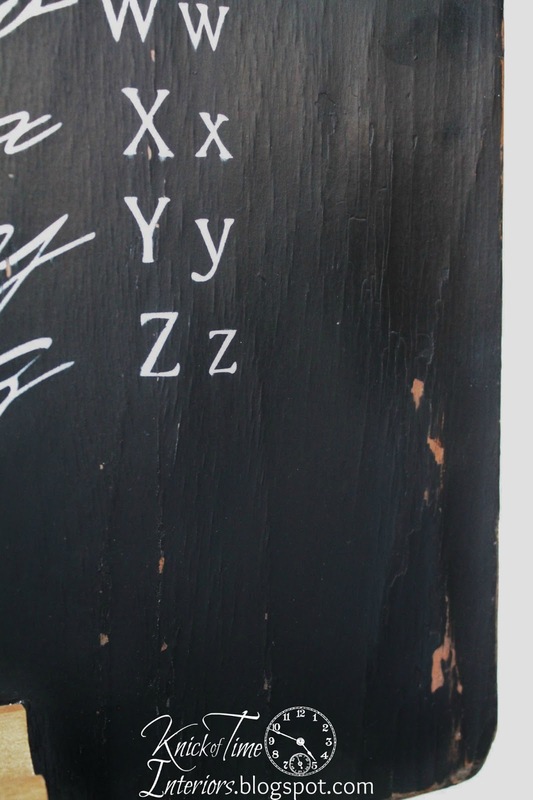 See all the letters with black spaces inside the white outline of the letter? All those black spaces are like itty bitty stickers that need to be hand-positioned with tweezer after you get the main block of your stencil laid down. Some of these letters had up to 4 little pieces inside of then to be put back in place! Theoretically, transfer tape would do that job more easily, but many of them came off the backing paper when we were pulling the bigger part of the vinyl off, so they had to be hand-positioned. Obviously, I wouldn’t want to try to mass-produce something like this because of the work involved, but I love making one, just to see if I can. I’m just overjoyed to have made a big replica of that precious school primer page. I didn’t have very long to get too attached to it, because it sold within 24 hours of listing it my shop. I may just try it one more time! Oh, Angie … that turned out so good. Placing those tiny pieces back in sounds very hard and time consuming. I want a silhouette really bad, but giving it second thoughts. Maybe someday you can do a tutorial on buying and using one. You are so talented to be able to learn it so quickly. I love it! And I very well know how tricky it was. Bravo for trying (and succeeding) and congratulations on a quick sale! 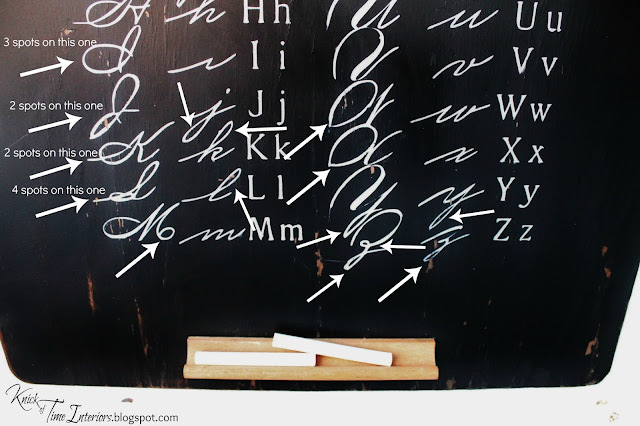 did you know that they no longer teach cursive in school? very sad, but that board is wonderful! This is very cool! So glad it didn’t cause you the same headache as the last project. Bravo!! Good for you Angie for sticking to it (no pun intended). I know exactly what you mean about trying to unstick the backing paper, I’ve had to call in an extra set of hand for that too. I just love how this turned out!! Angie that came out SO cute! Totally custom and one of a kind! 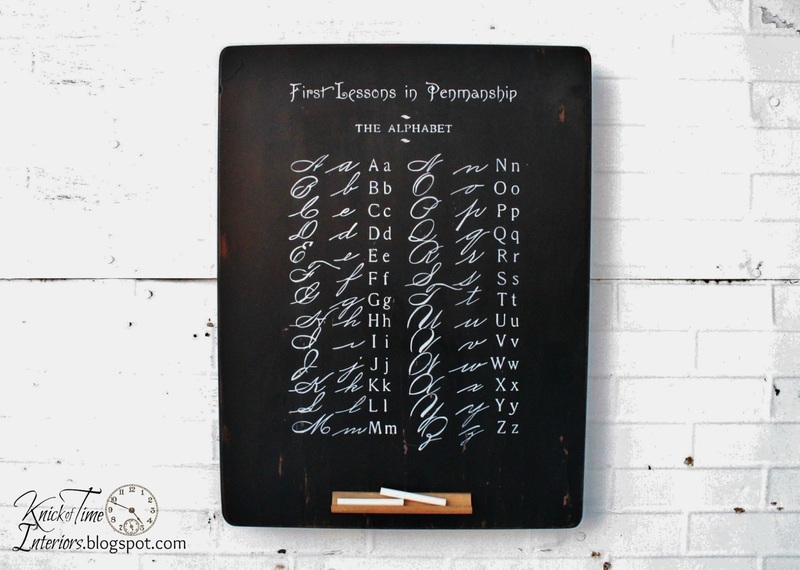 Oh I am not surprised it sold right away….I love anything with the alphabet…and this is precious. I don’t know how you could part with it… it turned out so beautiful!! I wish I had a Silhouette… my Cricut will only work with cartridges, I DON’T have! Oh my! This is lovely! Absolutely well worth the huge amount of work and frustration. I saved this one. I want to use a vinyl stencil on a chest of drawer project. Love how your project turned out. I do not know if i will ever purchase a Silhouette, but I have enjoyed going along with you on your journey to learn. Love how this turned out! I am featuring you on facebook. I love your alphabet primer. That is so cool! I’m seriously longing for a silhouette! But watching you instead saves time and the learning curve. I am in love with this! I don’t have silhouette though so I’ll have to find another way to create it. I am SO in love with the penmanship of “yesterday” and wish they still taught it. I love this sign — I can see why it sold so quickly! I love this! I so need a silhouette! Love these old books. I have one similar. Thank you for joining us at Transformed Tuesday this week. I just came over from Pinterest. The Graphics Fairy posted a very similar picture (but without the “First Lessons in Penmanship” at the top of the page. 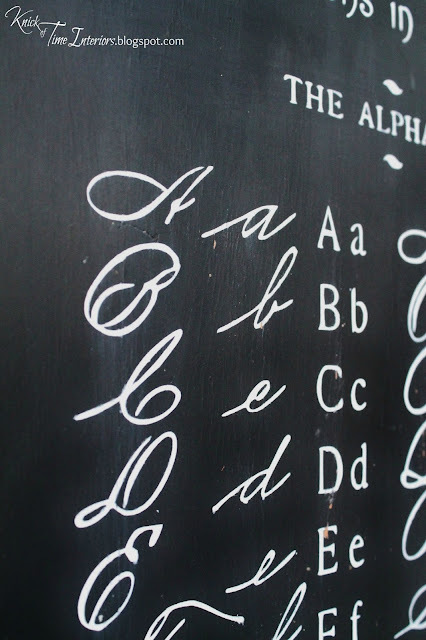 This is Spencerian penmanship, and you can still learn if you want to. Christian Book Distributors sells a reproduction of the 5 Spencerian penmanship books, and my children are all using them. I told them that when they have completed all 5 books (which takes about 4 years) that I will buy them their own fountain pen. I don’t have a silhouette or I would DEFINITELY be making one of these to go on the wall near the table where we have school. I will check out how much you charged, too, in case you decide to make another one. I have been wanting something like this for our wall and I absolutely LOVE it! it’s wonderful!! and I totally understand the difficulty with getting fine letters off, and the repositioning of the little ‘centers’. I so want one of these!! I love anything related to school history! Not sure how you created this, but great job! I simply love the chalkboard alphabet, esp. since I’m a retired teacher! BUT – I don’t understand HOW you used the silhouette and contact paper? (Maybe it’s because I don’t have a Silhouette.) I cannot understand the directions, even though you explained it well. Can you further explain? Thanks! Love it! I just bought a silhouette cameo. Would you consider doing a tutorial on how to do this? Thanks, I really admire your work.